Please enter your message in the box below and Gene will get back to you. Hooray, Papi is finally going to start delivering fish! You select the fish & seafood you want from a list we'll provide on this page. We go to the docks, get your order and cut it to your requested size. Click here to sign up with your name, address, email and phone number. You will get an email asking you to confirm your information and select a username and password. Click on the link in the email and follow the instructions on the page. NOTE: Please make sure emails from HometownSeafoods.com do not go to your junk filter. Once you have confirmed your information and selected a username and password, you will begin getting ordering emails as soon as the next ordering period opens. Click here for details on how to place an order. On days when you can order (see ordering schedule here), your Hometown Seafoods Home Page will automatically show you an order form. Follow the easy steps below to place an order. Click the button, which is under the TOTAL ORDER line below all the Fresh Seafood. You will now see a payment and confirmation page. Your name and the address to which the order will be delivered are displayed under the box labeled DELIVERY & PAYMENT. Please select a delivery spot for us to leave your cooler. We recommend a shady spot. Select a payment method under the heading PAYMENT. You can mail a check, leave it in a cooler (if you've ordered before), pay with PayPal or call with a credit card. See here for payment method details. Once you are sure all the information is correct and complete, be sure to click on the button under your order summary that says . PLEASE NOTE: your order is not confirmed and will not be processed until you confirm it by clicking on this button. If you choose this option, you will see a Pay Now Button. Click on that button and you will be taken to Paypay to make your payment. After you make your payment with paypal please click on the link that says return to Hometown Seafood.com. Paypal payments are charged immediately, based on the ordered weight. I will enter the actual weights on the next day and in most cases there will be a variance. You can see your adjusted order at HometownSeafoods.com. The variance, either as a balance due or credit will be applied to your next order. Pay by Credit Card. If you choose to pay by credit card and it is your first order, you will see a dropdown that includes the choice Call with Credit Card. If you select this option, a telephone number to call with your information will appear below the drop-down choices. This phone is not manned all the time so please leave a message and I will call you back to get your information. Don't worry if if takes me a couple of days to get back to you. Once I have your information and you make a repeat order, your default payment option will be Credit Card on File. From then on, it is no longer necessary to contact me after you confirm your order. But you must confirm your order in order for it to be processed. When you place your order, you will see the amount due on the "TOTAL ORDER" line at the bottom of the order form. The actual amount I charge to your card will vary a little based on the actual weight of the fish at the time I package it. The amount could be up or down a small amount. It may take two days before I can get all the work done and process your card. 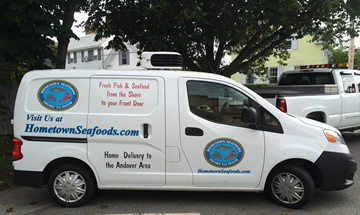 Your adjusted order will be available for you view at on your Hometown Seafoods Home Page. You will be able to see the adjusted order total, which is what I will charge your credit card for. Pay by Check. If you'd like to pay by check, that option is always available. If this is your first order, select the Mail a Check option in the drop down under the PAYMENT heading and an address will appear for you to mail a check. If you have ordered before, you can leave a check in the cooler instead of mailing it. In that case, you will see an option that says "leave Check in Cooler". Be sure you select the correct dropdown so I know if you are mail it or leaving it in the empty cooler you are returning. Your account will show the running balance amount due until I receive and deposit the check. The order form is only visible on your Hometown Seafoods Home Page during the time when you can place an order. We currently offer two ordering periods per week. Usually, ordering is open Sunday noon through Monday noon for delivery on Tuesday. Ordering opens again Wednesday noon through Thursday noon for delivery on Friday. Once in a while, due to holidays or weather, an ordering period may change or be skipped. When ordering is closed, your Hometown Seafoods Home Page will tell you the next time ordering will open. Click here for more details on placing orders. You will get an email when ordering opens telling you that you can place an order. There is a link in every email that will take you directly to your Hometown Seafoods Home Page -- and you can place your order there. You will continue to receive a new email every Sunday and Wednesday thereafter whether you order or not. You are free to order once a week, twice a week, or once a month; the option is yours. Click here for more details on placing orders. Your seafood will be in a Hometown Seafood cooler. 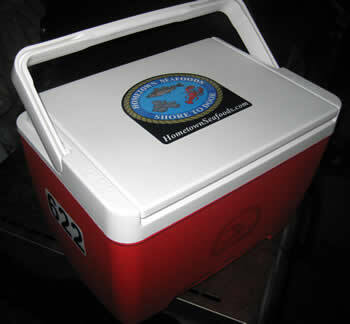 You will be charged a refundable deposit of $15 for this cooler on your first order. Starting with your second order, we ask that you put your cleaned cooler out for an exchange, and as long as you do that you will not be charged again for a cooler. This charge is to cover the cost of the coolers, and will be refunded if you opt out of the Hometown Seafoods service.